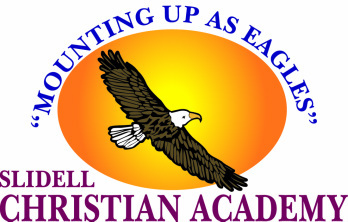 Thank you for your interest in Slidell Christian Academy (SCA). We are always happy to introduce you to our school family and to our campus and to share how the Lord has blessed SCA throughout its history. We enjoy giving tours of the school! To schedule a tour, call the SCA office at (985) 641-3785. SCA is a place where families can find a high-quality educational program in an atmosphere where Christ is honored in all things. SCA is a non-profit, religious, and educational institution. SCA does not discriminate among applicants for admission or employment on the basis of race, color, gender, or national origin. Applications for enrollment may be obtained from the SCA Office. You may also download the application below (Student Application for Admission Packet in Adobe PDF format). To begin the admissions process, a completed Student Application for Admission Packet and non-refundable registration fee should be submitted to the SCA office. It is the parent's responsibility to collect necessary documentation (report cards, standardized achievement tests, etc.) and to make sure that all legal papers (birth certificates, vaccination records, etc.) are in order. A list of all necessary forms is provided in the Student Application for Admission Packet. Report cards for the past two years and the last standardized achievement test (Leap Tests are not accepted) results must be submitted for admissions review. Students are accepted only upon evidence that they can succeed academically and contribute in a positive manner to the spirit and morale of SCA. The school administration must also be satisfied that the parent or parents will uphold SCA's spiritual, academic, and disciplinary standards.